Author(s): Takafumi Yano, Department of Electrical Engineering, Graduate School of Engineering, Kyoto University, Kyotodaigaku Katsura, Nishikyo-ku, Kyoto 615-8510, Japan. Hiroaki Natsukawa, Tetsuo Kobayashi. Background: When using integrative functional magnetic resonance imaging– magnetoencephalography (fMRI–MEG) methods, we have to construct a model based on prior information from an fMRI study. However, this predetermined model is unfortunately often insufficient because of a mismatch between the fMRI and MEG source-activated areas. Moreover, estimated signals from MEG data can be contaminated by sources that cannot be observed by fMRI (fMRI invisible sources). Methods: To address this problem, we propose a method to improve the normalized integrative fMRI–MEG method that enables the updating of the predetermined model using an iterative procedure, which is based on both model selection and an estimate of the fMRI invisible sources by beamforming. 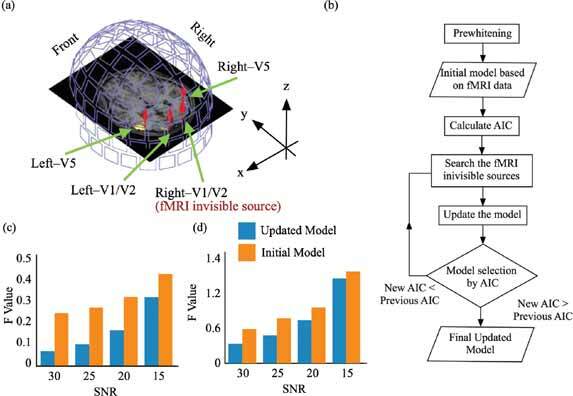 This updated model reduces the effect of fMRI invisible sources. Using the proposed method, we obtained an accurate model that accounts for the fMRI invisible sources, resulting in more accurate estimated source activities. To validate this proposed method, we performed simulations and assessed the accuracy of our estimates. Furthermore, we estimated the number and locations of the fMRI invisible sources. The simulation was based on an apparent motion perception experiment. White Gaussian noise and real MEG noise under open-eye conditions were used in the simulation. The accuracy of the estimated time course was assessed using the residual sum of squares. Results: The proposed method successfully estimated the fMRI invisible sources and provided a better estimation of the time course than that of predetermined model. Conclusion: These results demonstrate the feasibility of the proposed method. Keywords: model selection, MEG inverse problem, information criterion, fMRI -MEG integration. Affiliation:Department of Electrical Engineering, Graduate School of Engineering, Kyoto University, Kyotodaigaku Katsura, Nishikyo-ku, Kyoto 615-8510, Japan. Keywords:model selection, MEG inverse problem, information criterion, fMRI -MEG integration. Abstract:Background: When using integrative functional magnetic resonance imaging– magnetoencephalography (fMRI–MEG) methods, we have to construct a model based on prior information from an fMRI study. However, this predetermined model is unfortunately often insufficient because of a mismatch between the fMRI and MEG source-activated areas. Moreover, estimated signals from MEG data can be contaminated by sources that cannot be observed by fMRI (fMRI invisible sources).